Abuja — The completion of the Dangote Refinery in 2019 will mark another milestone in the Nigerian oil and gas industry. The refinery is being built by Mr Aliko Dangote, the founder of the Dangote Group of Companies and the richest man in Africa. The $14 billion (Shs50.6 trillion) refinery will produce 650,000 barrels per day of refined petroleum products to meet all Nigeria's needs, as well as for export. It holds the prospects of stopping the importation of refined petroleum products by the African giant. The West African state spent N2.59 trillion to import refined petroleum products in 2016, according to the Nigeria Bureau of Statistics. Mr Dangote said that the refinery projects were primarily meant to diversify the resource base of Nigeria. "This is the biggest industrial site anywhere in the world from the fertiliser, petrochemical and refinery plants. "Our refinery will be 1.5 times the capacity of all the existing four refineries in the country, even if they are working at 100 per cent capacity. "This is the single largest refinery in the world. The petrochemical that we have is 13 times bigger than the Eleme Petrochemical built by the government," Mr Dangote said. Acting President Yemi Osinbajo described the project as an incredible industrial undertaking, possibly the largest and most ambitious on the continent. Apart from refining crude oil, the Dangote Refinery will also have petrochemical and fertiliser plants. An Executive Director in the Dangote Group, Mr Mansur Ahmed, said the plant would process 1.3 million metric tonnes per annum of petrochemical products. The refinery will also have the largest sub-sea pipeline infrastructure in the world, with capacity to handle three billion cubic metres of oil annually. The project is located in Lekki Free Trade Zone on 2,200 hectares, an area eight times bigger than the entire Victoria Island in Lagos. According to Mr Mansur, the first phase of the plant will be ready by the end of 2017, the second by end of 2018, while the third and the inauguration of the refinery will be in 2019. It is regrettable that Nigeria, with large oil reserves and being the largest crude oil producer and exporter in Africa and eighth in the world, still imports more than 80 per cent of its petroleum products. The country often experienced fuel shortages due to the poor state of its refineries. All the three refineries, operated by the Nigerian National Petroleum Corporation (NNPC), were producing far below their capacity. 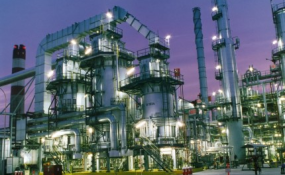 The Port Harcourt Refinery has 10.500 million mt/y (metric tonnes per year) capacity of refined products, but it was producing at less than 20 per cent of the capacity. The Kaduna Refinery, built in 1980, has capacity to produce 5.5 million mt/y (110,000 b/d), while Warri Refinery, built in 1978, can produce 6.2 million mt/y (125,000b/d) of refined products. With the Dangote Group on board, Nigeria will now host one of the largest refineries in the world after the Jamnagar Refinery in Gujarat, India, the world's largest, which produces 1,240,000 barrels per day. Mr Dangote has already provided $7 billion in equity out the $14 billion estimated total cost of the project. The African Export-Import Bank (Afreximbank) has also promised to assist the Dangote Group to access foreign funding for the project. Afreximbank President Okey Oramah gave the assurance during a tour of the project with the bank's board members in 2016. Dr Oramah said the board members decided to visit the Dangote Group to assess the project for possible financial assistance. He said the Dangote Group was making tremendous impact across the continent, which included in Tanzania, Gambia, Zambia and Niger. "We are supporting them in what they are doing in those countries, so we are equally supporting them in this ongoing project, so it is important for the Board of Directors of Afreximbank to pay a courtesy visit to the site. "It is important to come and see first-hand the project that is ongoing because we are also planning to support them to ensure the project is delivered on scheduled," said Dr Oramah. Some other private investors were still visiting the project site to evaluate the facilities with the prospect of investing in the project. Mr Dangote said that the project would save the country about $7.5 billion annually in foreign exchange being used to import petroleum products and also generate $5 billion foreign exchange earnings annually. Dangote said that the refinery would lower the price of petrol products in Nigeria and save some costs incurred in importation. He urged the Federal Government to pursue the diversification programme, to wean Nigeria from heavy reliance on crude oil export. According to him, the best way to diversify the economy was through agriculture and "our fertiliser plant is in line with that goal". "By the time we finish out gas pipeline, it can generate about 12,000mw and we can export gas to other African countries. "We would have the capacity to store four billion litres of products and can load 2,680 trucks per day." The Lagos State Governor, Mr Akinwunmi Ambode, said the project would create some 235,000 jobs both directly and indirectly. The Independent Petroleum Marketers of Nigeria National President, Mr Chinedu Okoronkwo, described the Dangote Refinery as a welcome development. He said it would ease operations of marketers and help to reduce their costs, stressing that the association had long been calling for total deregulation of the sector. He said that the new refinery would also boost industrialisation in the country. The President of Nigerian Association of Petroleum Explorationists, Mr Abiodun Adesanya, said the success of Dangote Oil Refinery was an indication that the Nigerian private sector could make commercial success of refineries.